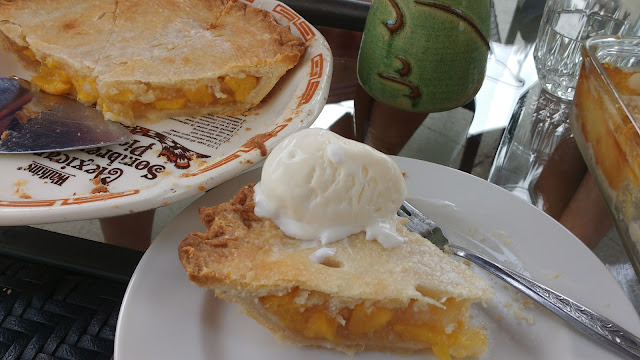 I made Judy's Peach Pie but wanted to try a new crust recipe with a cream cheese pastry which was delicious. Combine the dry ingredients and work in the butter and cream cheese until you have a crumble texture. Add the cream. At this point the dough may be chilled for an hour for easier handling, but I made my pies immediately. I found this crust not to be as flaky as my other one, but richer and very tasty. This amount makes 2-8 or 9 inch double crusted pies. Just double the filling if you are using Judy's recipe for peach pie. I highly recommend you do as peach pie is awesome!!! This looks delicious and one of my friends on facebook says that this is her favorite crust for her pecan pie!